OpenRoad Lending Reviews - Is it a Scam or Legit? OpenRoad Lending is a Texas-based lender who specializes in refinancing auto loans. Their site claims that you can start an application and get approved within minutes, making the refinancing process as simple as possible. OpenRoad is based operates in Fort Worth and is led by President and CEO Chris Goodman, who has an extensive background in auto lending. How does the OpenRoad refinance process work? What are their loans limitations and restrictions? Is it worth it to refinance your car? What are other people saying about OpenRoad? We’ll finish up with a quick section on the company’s general pros and cons. How Does the OpenRoad Lending Refinancing Process Work? The only information here that differs from what you’d provide for a non-refinance car loan is the name and account number of the company you have an auto loan with. Now, a bigger question here is, "Why refinance?" Well, the main goal of refinancing is to get a lower monthly payment. We’d say that’s the main advantage. The main disadvantage is that your refinance will extend your repayment period. If you were halfway through a six-year loan, refinancing could add another three years to your repayment period. Once OpenRoad has the information they need, they’ll process your application and let you know if there are any errors or questions about what you submitted. From there, they’ll make a decision about your loan terms, including your APR, length of repayment and what your monthly payments will be. And, finally, OpenRoad will check your credit as part of the application. The better your credit scores, the lower your interest rate will be. Pro tip: If you’re a resident of Kansas, Kentucky, Maryland, Michigan, Minnesota, Missouri, New York, Oklahoma, South Dakota or Wisconsin, you’ll have to send your title to OpenRoad to complete the loan application. Residents of other states don’t need to. What Are the Requirements/Limitations for an OpenRoad Refinance? Lending companies want to make money off their loan and they do that by extending your repayment period so they can get your interest payments. OpenRoad wants your car to meet these requirements because it’s their way of guaranteeing that, in the event you don’t pay your loan, they can resell the car and not lose a ton of money. This explains why they don’t want cars with a ton of miles, older cars or cars with loan balances that are 20% higher than what the car is worth. OpenRoad also won’t refinance cars from the following six manufacturers: Oldsmobile, Daewoo, Hummers, Saab, Suzuki or Isuzu. “Branded titles” refers to titles that have notes showing the car was marked as a total loss because of fire, flood, collision and other situations. 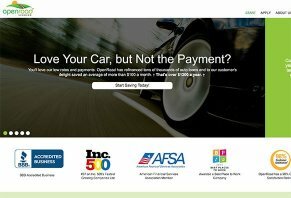 What Fees Will You Pay for an OpenRoad Auto Loan Refinance? According to OpenRoad’s website, you won’t pay an application fee or any E fees for your loan. “Origination fee” refers to the fee that most lenders charge for all the expenses related to processing your application and your loan. While OpenRoad is certainly being consumer-friendly with their lack of fees, remember that they’re making money via the interest payments you make, not the up-front charges. We’ll explain why that’s important in the next section. Is it Worth it to Refinance Your Car Loan? Earlier in this review, we mentioned that a refinance allows you to lower your monthly payments by extending your repayment period. You win because your payments are lower and the lender wins because they get the interest. Now, in some cases, your credit score may have gone up significantly since you signed for your original loan. If that’s you, a refinance may be a good choice because your much better score will get you a much lower rate. Okay, so, if you never refinanced your original $35,000 loan, you’d end up paying a total of $10,190 in interest over six years. But, let’s say you decide to refinance with OpenRoad after three years. Instead of paying six years of interest on the original loan, you only pay three years’ worth, or $5,095. Then, after three years, you switch to a six-year OpenRoad loan that refinances the remaining loan balance ($17,604) at the same interest rate you had before. Your monthly payments will be $145 lower because they’re spread out over six years rather than three years. However, you’ll pay $2,081 more in interest than you would have if you stuck with your original loan. Now, if you get an 8% interest rate on your refinance instead of 12%, your monthly payment becomes $180 lower and you’ll save $476 in interest that you would have paid if you kept your original loan. This might seem like a win-win situation because your monthly payments are lower and you save on interest. However, remember that you’re making car payments for nine years: three years on the original loan and six years on the refinance. The consumer reviews we read about OpenRoad were mixed, with some customers saying they were happy with the money they saved and others expressing frustration over being denied a refinance as well as a drop in their credit score as a result of the credit check run as part of the application. Based on what we’ve read, we think it’s important you know that there’s no guarantee you’ll be approved for a loan even if you get a letter in the mail that OpenRoad has pre-approved you. All that really means is you fit a loose profile of who can qualify; it’s not a hard “yes”. We believe OpenRoad’s greatest strength is that their online application is expedient as long as you provide the necessary information. We also think it’s advantageous to you that they don’t charge any origination fees or application fees. On the downside of things, we believe that refinancing, in general, may not be the best choice for all consumers, especially those who can’t get a better interest rate than what’s on their current loan. Second, OpenRoad isn’t a good fit for those who’ve financed vehicle makes that aren’t allowed to be refinanced: Oldsmobile and Hummer are probably the two most popular. Write a Review for OpenRoad Lending!